The exterior of the J.T. 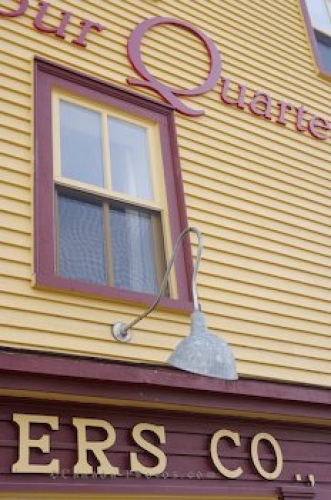 Swyers General Store in the town of Bonavista in Newfoundland Labrador is adorned in a soft yellow color with a brownish/red shade used for the frame of the window and the writing "The Harbour Quarters". Below the window, the J.T. Swyers Co. Ltd. lettering is painted in the same color as the top half of the general store, all which has been restored in 1997. The interior of the general store was also redone as the building was declared as a heritage building in March of 1996. The building was built in 1910 for a merchant named Philip Templeman who ran his business operations from here. After his death in 1926, the business fell apart and the family sold the buildings to J.T. Swyers. In 1892, Joseph Thomas Swyers opened his store with the business growing which supplied the fisherman having dealings with the French and Labrador fisheries. Picture of the exterior of the J.T. Swyers General Store in Bonavista in Newfoundland Labrador. J.T. Swyers store continued to grow and by the first decade of the twentieth century he had control of about 120,000 quintals of dried cod every year. He soon formed a partnership where they created a shipyard in Charlottetown in Bonavista Bay and the company was incorporated in 1920. His passing in 1965 saddened the community and surrounding areas but his general store thrived until 1973-1974. Visitors to the Harbour Quarters in Bonavista, Newfoundland Labrador can browse through the J.T. Swyers General Store where a gift shop and coffee shop make up the first floor of the building. The Harbour Quarters, JT Swyers Co Ltd in the town of Bonavista, Bonavista Peninsula, Bonavista Bay, Highway 235, Discovery Trail, Newfoundland, Newfoundland Labrador, Canada.